FILE - Wang Zhaohong, who suffers from silicosis, is seen on his bed in Sangzhi county, Hunan province, China, Nov. 27, 2018. For four years at the turn of the century, Wang Zhaohong worked on a demolition crew in Shenzhen, clearing the way for the once-tiny border village to become a bustling metropolis. Now, emaciated and struggling for breath, the bedridden 50-year-old says the work he did will end up killing him. Without proper safety equipment, he and his colleagues from a remote county in Hunan province inhaled so much construction dust during Shenzhen's development boom that they contracted silicosis, a lung-destroying condition. Wang's case is acute. He expects to suffocate by Chinese New Year. This month, China will celebrate the 40th anniversary of its "Reform and Opening," the economic policy that transformed it into the world's second-largest economy. Even as hundreds of millions of people have left poverty, Wang and others like him are reminders of the heavy human toll of China's development, and authorities have sought to censor information and suppress protests. About 6 million Chinese either suffer from or have already died from pneumoconiosis, or dust-caused lung damage that includes silicosis, according to estimates by Love Save Pneumoconiosis, a Beijing NGO that advocates for workers suffering from the condition. Hundreds of migrant workers from three counties in Hunan province, including Wang, have been protesting for compensation from Shenzhen. "We used to wear the same mask for 10 days before getting a new one," Wang said in his village in poor, rural Sangzhi county. "At the time our boss would say to us, 'If you use a new mask every single day, how will I ever make any money?'" 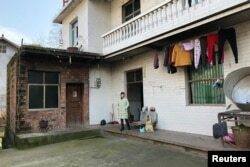 The workers earned 5,000-6,000 yuan ($739-$870) each month, double or triple what other migrant workers were paid at the time. Almost no one signed contracts, which has made it nearly impossible for them to seek adequate compensation. The Shenzhen government has offered some workers payments dependent on the severity of their illness of up to 220,000 yuan ($32,000), according to Gu Fuxiang, one of the worker representatives. But he said it was not nearly enough. FILE - The wife of silicosis patient Wang Zhaohong stands in front of their house in Sangzhi county, Hunan province, China, Nov. 27, 2018. Their prospects look grim in what has been a nearly decade-long fight. Security forces attacked them during their most recent sit-in at Shenzhen's city hall in early November, according to five workers who were there. "For both the local government here and the Shenzhen government, maintaining stability is absolutely their first priority," said Gu, who has less severe silicosis. "We traded our lives for development," he said. "The government doesn't care if we're sick, if we die." A Shenzhen government spokesman referred questions to the police department, social security department, health department and economic reform department. The health department hung up on a call seeking comment; the economic reform department declined to comment. The police and social security departments did not respond to multiple calls. The health crisis is not unique to China; advocacy groups in the United States struggled for decades to win compensation for workers dying of such "dust diseases." But the pace of China's building boom has created an unprecedented number of casualties in just 40 years. No city in history has grown faster than Shenzhen, whose economic output surpassed that of its next-door neighbor, Hong Kong, for the first time last year. Shenzhen expects to have the largest metro network in the world by 2030, with 32 subway lines, according to the official China Daily newspaper. Migrant workers laid the foundations for many of Shenzhen's best-known sites, from the city's northern train station, which connects Shenzhen to Hong Kong and Beijing, to the Ping An International Finance Tower, the fourth-tallest building in the world. Despite the megacity's success, workers have mostly had to take out high-interest bank loans and borrow from family and friends to cover medical costs, their children's school fees and other expenses. To pay for his hospital visits, Wang borrowed 50,000 yuan from a rural banking cooperative that is charging him 11.27 percent interest per quarter, according to the loan document he showed Reuters. "The bank still gives us loans because our children co-sign. My son has agreed to pay them back once I'm dead," he said as he rotated homegrown sweet potatoes roasting over charcoal next to his bed. The Shenzhen government paid Wang 130,000 yuan in 2009, when his illness was diagnosed, but he says it hasn't been enough. "In China, the problem isn't a lack of money. Shenzhen has an enormous social insurance fund. The problem is ideology," said Pun Ngai, a sociology professor at Hong Kong University, who has spent years following the workers' plight. 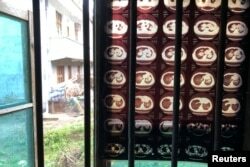 FILE - Negatives showing the lungs of Wang Zhaohong, who suffers from silicosis, hang on the window of Wang's room in Sangzhi county, Hunan province, China, Nov. 27, 2018. "The Shenzhen government doesn't think these workers are their responsibility since they aren't Shenzhen residents," Pun said. "And the government is worried if they submit to the workers' demands, people from other provinces will also come seeking compensation." The social insurance fund of Shenzhen, with an official population of 12.5 million, totaled more than 540 billion yuan at the end of 2017, according to official figures. The workers told Reuters that Beijing has come down hard, threatening them and anyone who comes into contact with them if they speak out. Authorities in mid-November forbade all websites from reporting or publishing stories related to the Hunan workers suffering from silicosis, according to the China Digital Times, which tracks censorship in China. Prominent state-owned newspapers and television stations covered their plight in 2009 but this year have been silent on the issue. This censorship is consistent with an overall political tightening in China over the past five years and comes amid a crackdown on student-worker protests that started in southern China and spread around the country. In August, about 50 students and other activists from around the country came to Shenzhen to protest with factory workers about the poor conditions at a factory owned by Jasic, a welding company. "The case of the silicosis workers this year has become very, very sensitive because the government is worried it will become connected to the Jasic case," Pun said. The workers have made 11 trips to Shenzhen this year but say they are still waiting for adequate compensation. They are asking for compensation of between 500,000 yuan and 1.1 million yuan, depending on the worker's condition, Gu said. Less than 12 hours after Reuters arrived in Sangzhi county, the local police began calling workers, ordering them to report to the local police station and verify with whom they had met. The Sangzhi county police declined to comment. "The authorities really know how to frighten us; a lot of the workers are too scared to have anything to do with foreign media right now," said Gu, adding that Shenzhen government officials had told him both his phone and WeChat were monitored. But Wang said he was more worried about the huge debt he was leaving to his family, and repeatedly wondered aloud whether there was any point in telling his story. "Our country has progressed so quickly over the past 40 years, farmers don't necessarily have to farm anymore, it's really wonderful," he said wistfully, breathing with the aid of tubes in his nose, as X-ray images of his stricken lungs hung in the small window that looks out onto his neighbor's house. "I wish I wasn't bedridden, then I could go out and explore all that is out there," he said. "Instead, I'm going to die very soon."